When you walk into a sanctuary of brisk aromas and beautiful shades of green, resisting the urge to bring home a colony of new succulents, air plants, or cacti is a difficult challenges. But if you wanted to support local in turn, we created this guide—happy gardening. Are you a nursery newbie who wishes to be more in tune with their inner gardener, Sloat Garden Center tends to the newcomers who wish to get involved with their nursery community. Let the sound advise from the nursery employees light the spark into your future garden and go crazy for their vast selection — sloatgardens.com. Marrying cultural textiles and modern design, trying to leave Hortica in the Castro will be like breaking up with a longstanding boy/girl-friend. With multiple turns and corners, finding yourself variety is not difficult with their overwhelming volume of foliage, big and small. Need to know more? Stop in and get your questions ready as the employees will dish the expert need-to-know knowledge — gardenhortica.com. Bring the excellence of Joshua Tree to the balcony or backyard of your personal garden, Cactus Jungle hosts the most impressive selection of the cacti family this side of the west coast - so finding a little prickly friend to take home will not be a challenge for you. Also offering their own organic Cactus Meal, you’ll be able to keep your cactus friend alive for twice the time — cactusjungle.com. Tucked away behind the craziness of Geary street hides the aromatic charms of Clement Nursery, San Francisco’s oldest nursery has reopened its gates to it’s Outer Richmond community and we’re most excited than ever. Walking into this full nursery will be like walking into the conservatory. The amount of life blooming within its gates is incredibly beautiful. Go ahead and get lost in the brush — Clement Nursery / FB. Walking into literally Narnia, Flora Grubb Gardens hosts the tallest of trees, smallest of succulents, and the damn best coffee in town. Grab yourself a cup of joe and meander around the premises as their vast wealth of greens will single-handedly impress and pressure you to take home a 12-foot palm tree. Our advice: bring a vehicle that’ll do the job right. Don’t even think about busing or ubering your new found friends home — floragrubb.com. 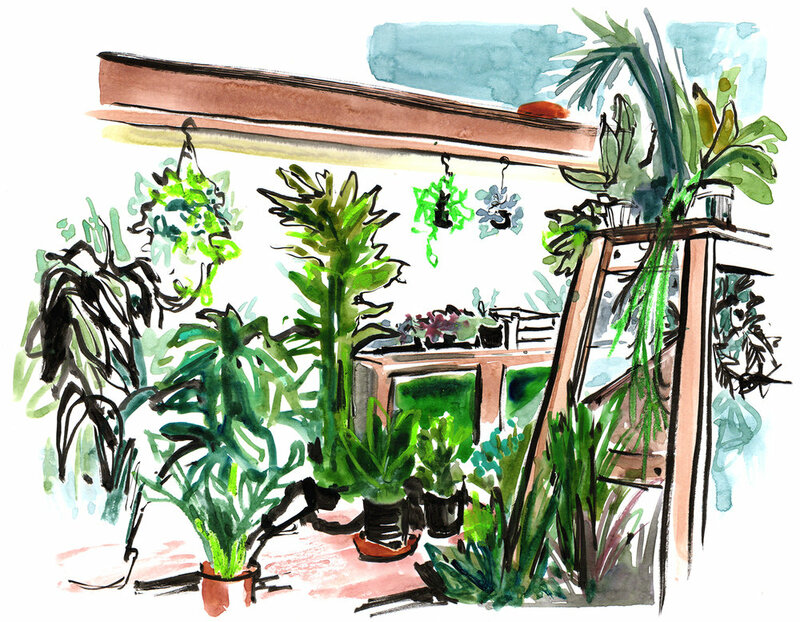 Being acclaimed as one of SF’s most stylish nurseries, Succulence is the happening Bay Area spot for gardeners and hipsters alike to share their knowledge and personal affinity for the green thumbs they share. Whether you’re starting your nursery for the first-time or restocking on what your little friends need most - Succulence is your one stop shop — thesucculence.com. // Illustrations by Briana Kranz—get to know Bay Area culture like never before.